Few animals evoke the wild like wolves: Majestic, rangy and highly social, they’re crucial in driving evolution and balancing ecosystems. Wolves once roamed freely throughout North America, in numbers estimated at some 2 million. But federal extermination programs and conflicts with human settlements have reduced their numbers to the breaking point. By the 1960s gray wolves were finally protected under what would become the Endangered Species Act. They had been exterminated from all the contiguous United States except a portion of Minnesota and Isle Royale National Park in Michigan. Trump is gearing up to strip protection from nearly every wolf in the lower 48. 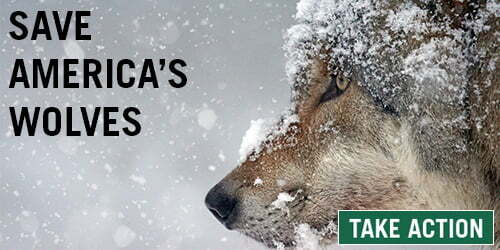 We’re fighting back with Call of the Wild, a national grassroots campaign to save America’s wolves. Please join us. After receiving federal protection, gray wolves saw tremendous recovery in the western Great Lakes region. Their populations grew to around 4,500 and expanded through Wisconsin and Michigan. Through natural migration from Canada and reintroduction to Yellowstone National Park and central Idaho, wolves returned to the northern Rockies and are establishing a toehold in the West Coast states. There are now about 1,700 wolves across Idaho, Montana, Wyoming, Washington and Oregon, with a few wolves beginning to range into California. In the Southwest Mexican gray wolves also saw recovery — but to a lesser degree. Just seven surviving Mexican gray wolves were captured between 1977 and 1980 and bred in captivity. After their progeny were reintroduced into Arizona and New Mexico, Mexican gray wolves now number 110 in the U.S. wild, but fewer than 20 remain in Mexico. 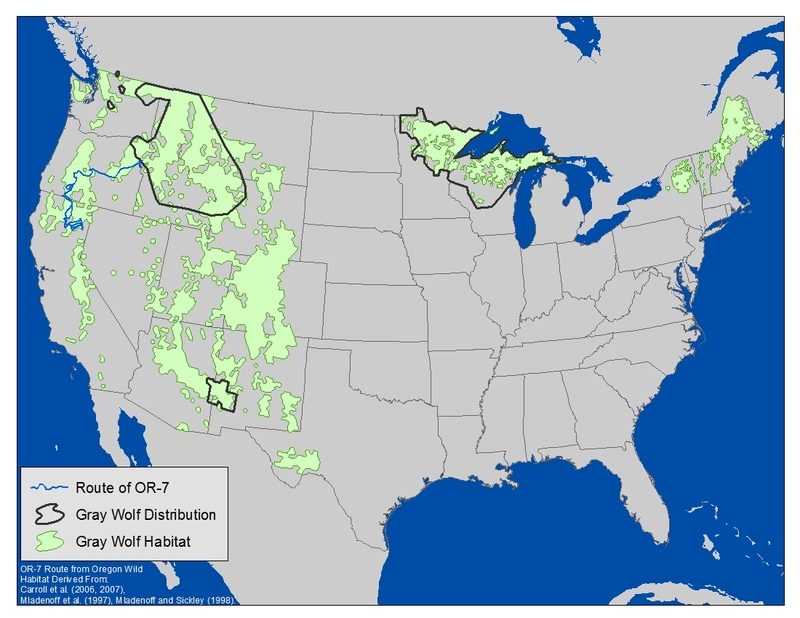 Despite these substantial gains, the job of wolf recovery is far from over. Wolves need connected populations for genetic sustainability, and natural ecosystems need wolves to maintain a healthy balance of species — yet today wolves occupy less than 10 percent of their historic range and continue to face persecution. The Center has worked to save wolves since our inception, and we continue to defend them through science, the law and with our supporters’ help. Beginning in 2003 the U.S. Fish and Wildlife Service began moving to reduce or remove protections for wolves, but was repeatedly rebuffed by the courts. In 2009 the agency published separate rules removing protections in the northern Rockies and western Great Lakes, allowing wolf-hunting to move forward in both regions and spurring a court battle. In the northern Rockies, the Center and allies successfully restored protections through a court victory, but in April 2011 Congress attached a rider to a must-pass budget bill that stripped Endangered Species Act protections from wolves in all of Montana and Idaho, the eastern third of Washington and Oregon, and a small portion of northern Utah — an unprecedented action that, for the first time in the history of the Act, removed a species from the endangered list by political fiat instead of science. Wolves remained protected in Wyoming, but in September 2012 the Fish and Wildlife Service again moved to delist them. The 2009 rule removing protections in the Great Lakes states of Minnesota, Wisconsin, Michigan and portions of South Dakota and North Dakota, Iowa, Indiana and Illinois was likewise quickly overturned in the courts, but Fish and Wildlife came back in 2011 and again removed protections in the region. With protections removed in the two regions where wolves actually occurred, the Obama administration issued a proposal in 2013 to strip Endangered Species Act protections from gray wolves across the rest of the lower 48 states outside the Southwest, where the Mexican gray wolf was struggling to survive. The proposal asserts that wolf protection in place in the continental United States since 1978 is no longer needed. In September and December 2014, two federal court rulings prompted by lawsuits filed by the Center and other allies restored federal protections to wolves in Wyoming and in the western Great Lakes states, with the judges in each case finding that in stripping protections for wolves the Fish and Wildlife Service violated the Endangered Species Act. This in turn has stalled the administration's plans to remove protections across the lower 48, and today wolves remain protected everywhere except those areas in the northern Rockies where Congress' disastrous rider removed them. Unfortunately, Congressional Republicans are again attempting to meddle in what should be scientific decisions and have introduced multiple riders to various budget bills to again strip wolves of protection in Wyoming and the Great Lakes. And the Trump administration is planing a proposal to strip wolves of federal protections nearly everywhere else in the country is still pending. The Center is continuing to work with allies on Capitol Hill to halt any wolf-delisting riders on any budget bill. Since the Center's inception, we have campaigned for wolves, adapting our efforts as the opportunities for recovery changed. We have taken the long view, even while addressing short-term threats. Our 1990 lawsuit, with allies, to compel reintroduction of the Mexican gray wolf led to a 1993 settlement agreement that resulted in the 1998 reintroduction of the wolves into the Apache and Gila national forests. The Center, founded in the Gila in 1989 and maintaining staff in the reintroduction area to the present day, monitors wolf and habitat management. We have vigorously challenged federal shooting and trapping of Mexican wolves and are pushing for the resumption of wolf releases from captivity to the wild. We've petitioned and sued for changes in wolf management, development of a new, science-based Mexican wolf recovery plan, and listing of the Mexican wolf as an endangered subspecies or population of the gray wolf to afford it the right to such a plan. We help organize public pressure on agencies and elected officials to provide maximum protection for the beleaguered Mexican wolves. We currently have two active lawsuits filed against the Fish and Wildlife Service. In the northern Rocky Mountains, the Center was part of four successful lawsuits that delayed the removal of federal protections for wolves from April 2003, when first promulgated by the Bush administration, until May 2011, when protections were finally (though still prematurely) removed through the infamous congressional rider. Our legal efforts helped to allow the wolf population to grow by 1,000 animals during those eight years, from 761 to 1,774. The Center mounted an unsuccessful legal challenge in district and appeals courts to the constitutionality of the rider. Since then we have helped publicize the slaughter of northern Rockies wolves, as part of a long-term strategy to pressure Congress to rescind the harmful rider, and filed a lawsuit that was successful in restoring “endangered” protections to wolves in Wyoming, where the 2011 rider does not apply. We have also stood up for protection of the growing but still vulnerable population of wolves in Washington, Oregon and California. In 2006, with all these wolves still protected as endangered, we successfully opposed issuance of a permit to allow killing wolves in Oregon on behalf of the livestock industry. After the 2011 delisting of most wolves in the state, the Center and allies successfully sued under state law to save the lives of two wolves that Oregon officials had ordered killed. In 2012 we helped kill an Oregon bill that would have overturned our success in court and allowed the wolves' destruction. We also filed a scientific petition with California officials to place wolves on the state's endangered list and prepare a recovery plan — and in early June 2014 the California Fish and Game Commission voted to protect wolves under the state Endangered Species Act, just hours after scientists confirmed that OR-7 — the wolf that wandered into California in late 2011 and returned periodically — had sired pups in southern Oregon. California is now home to its first confirmed family of wolves in nearly 100 years: The Shasta pack, so named because this wolf family was identified and confirmed in August 2015 to be establishing territory in Siskiyou County, home to majestic Mount Shasta. Because of the Center's successful state-listing petition, the Shasta pack and any other wolves that disperse to California are now fully protected under state law, and harming, harassing or killing a wolf in California for any reason other than in defense of human life is illegal. In the Midwest, as in the northern Rockies, multiple lawsuits filed by the Center and allies helped delay removal or reduction of protections, allowing continued growth in the wolf population. In 2012 we filed a challenge to Minnesota's first-ever regulated wolf-hunting season. In a groundbreaking victory for Great Lakes wolves, they were again granted Endangered Species Act protection in late 2014, after a federal court ruled in a case brought by one of our partners showing that prematurely stripping wolves of protection violated the Endangered Species Act. In the Midwest, as in the northern Rockies, multiple lawsuits filed by the Center and allies helped delay removal or reduction of protections, allowing continued growth in the wolf population. In 2012 we filed a challenge to Minnesota's first-ever regulated wolf-hunting season. In a groundbreaking victory for Great Lakes wolves, they were again granted Endangered Species Act protection in late 2014, after a federal court ruled in a case brought by one of our partners showing that prematurely stripping wolves of protection violated the Endangered Species Act. That victory stopped wolf hunting but Congressional Republicans have continued to try to undo the court ruling by attaching delisting riders to major federal budget bills. In January 2016 the Senate Environment and Public Works Committee passed the so-called “Bipartisan Sportsmen's Act of 2016,” with the inclusion of an amendment to permanently end Endangered Species Act protections for gray wolves in Wyoming and the western Great Lakes states. Since the original wolf recovery plans were written in the 1980s, we've learned much more about wolves' behavior, ecology and needs. We know, for example, that returning wolves to ecosystems sets off a chain of events that benefits many species, including songbirds and beavers that gain from a return of streamside vegetation — which thrives in the absence of browsing elk that must move more often to avoid wolves — and pronghorn and foxes that are aided by wolves' control of coyote populations. A mere 5,000 to 6,000 wolves occupy less than 10 percent of the animals' historic range in the lower 48 states. Establishing wolf populations in remaining suitable habitat in the Northeast, southern Rocky Mountains, Southwest, Pacific Northwest, California and elsewhere would secure a future for wolves and allow them to play their valuable ecological role in more of their former range. The Center seeks an end to wolf persecution and seeks to link isolated wolf populations to combat inbreeding and allow ecosystem rejuvenation on a broader scale. Your support is crucial to our fight to save wolves and other species.